I usually get to see Thailand's Suvarnabhumi Airport from the outside. Only maybe one out of ten visits that I get to be a passenger and not an airport shuttle service driver. The flight from Bangkok to Siem Reap is very short. By the time flight attendants collected empty snack box, the plane was already descending. Siem Reap Airport is flat, small but very new and very nice. If you judge the cleanliness of a place by its toilets like I do, this one is very clean also. With all mischevious thoughts left behind, we proceeded to our first destination in a van. I think we paid USD 40 each for a three-day pass we had to show when visiting the individual sites. It is a mini mart plus gas station all right. Our van brought us through some green fields to Banteay Srei Temple. It is that small place on the upper right corner of this map, away from Angkor Wat and Angkor Thom in the center. As this is supposed to be a photo diary, kindly refer to official or trusted sources for details on each place. I will try to include what little I read or was told but please know that I am just a regular tourist on a trip two days too short! Banteay Srei is said to have been built with red sandstone. Well, it did look redder as gray clouds opened up to let yellowish sunlight through. Photography was not allowed at the museum we visited afterwards so this pictorial tour must take a quick warp to dinner. I am never a beer person but I always make it a point to try local stuff when I travel. They don't produce wine here so beer is the natural (and cheapest) choice. The hotel, finally, after a long day in hot and humid weather. 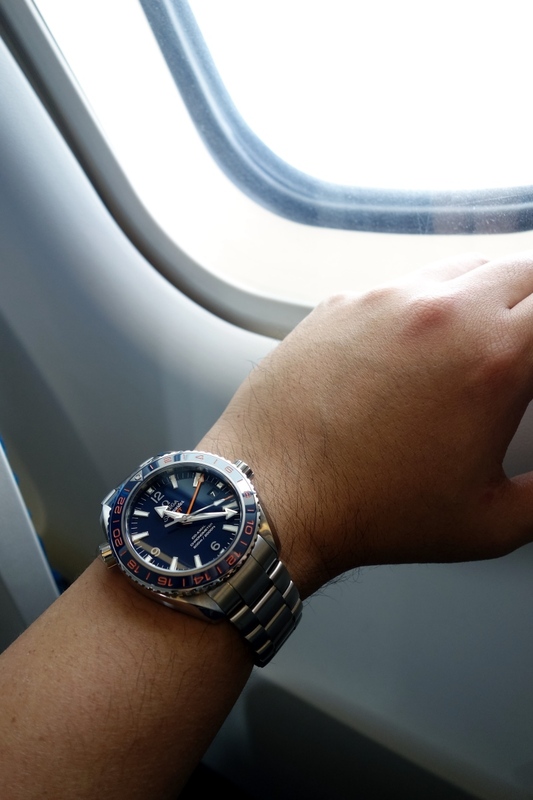 Another friend of mine was wearing his Omega Seamaster. 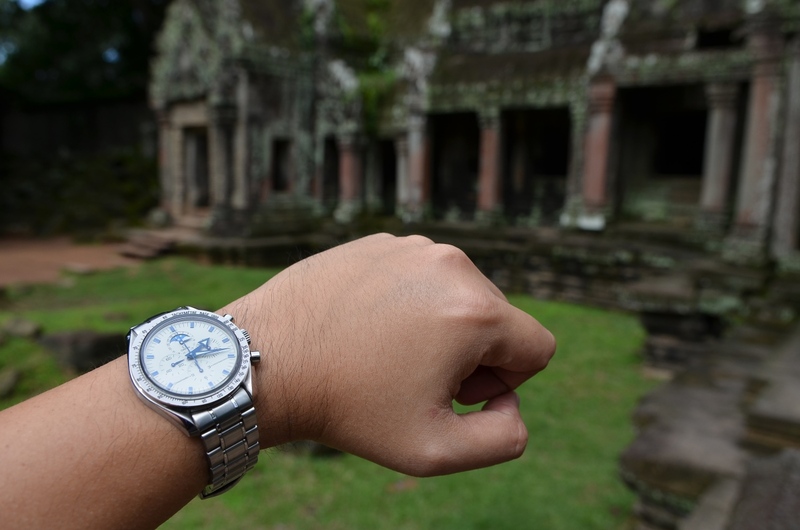 And the Dynamic guy has switched to a Speedmaster Moonphase to match another friend. 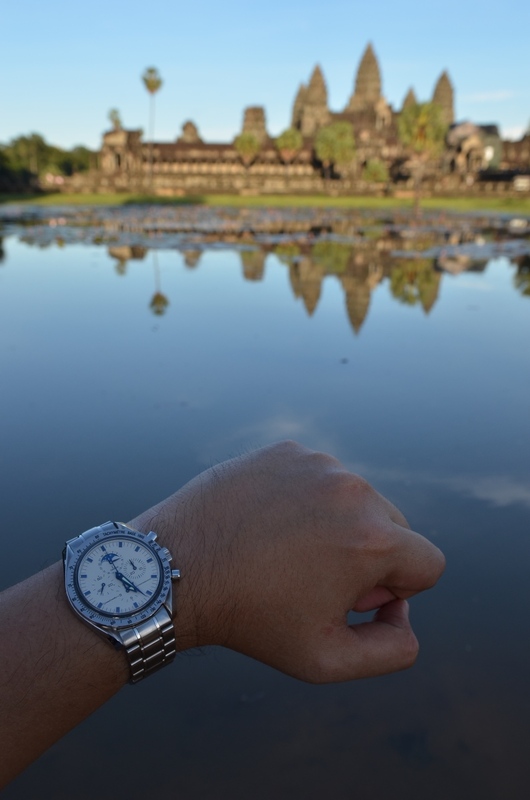 Four out of six travelers agreed to wake up super early the following morning for the sunrise shots at Angkor Wat. While it was not exactly spectacular, it was memorable enough, especially with the reflection in the pond. Empty corridors like this can be expected in the morning time only before all tourists arrive. The lady was reading in solitude. I was glad the shutter noise was not carried that far by the eerie silence of early morning. The following three pics are the left-most, the center and the right-most sections of a major bas-relief work on a gallery wall. Please look up "Churning of the Ocean of Milk" on the Internet and you will understand the story behind this depiction. 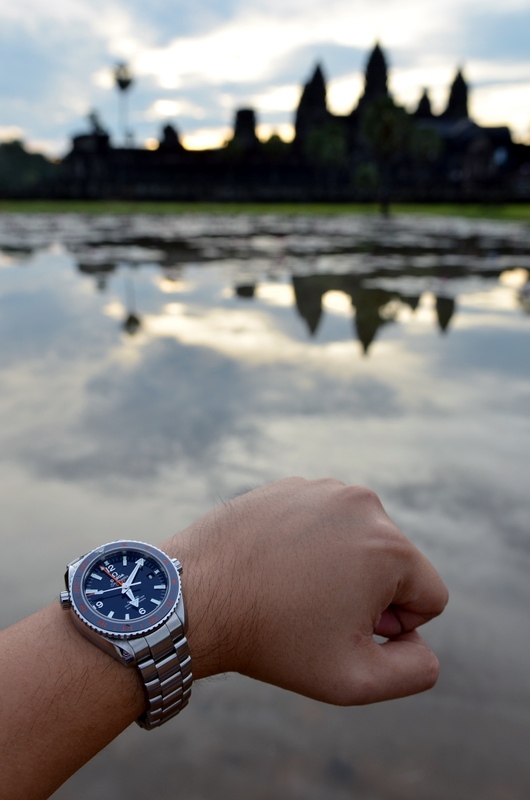 A new watch for the new day. My very long quest for a new old stock Speedmaster Replica Moonphase has come to an end. I finally have it on my wrist after 13 years of wanting. 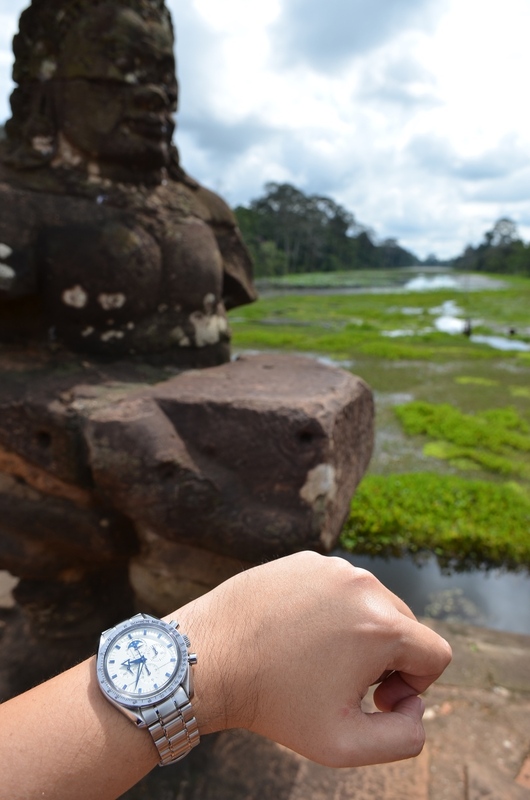 Our group visited Angkor Thom next. 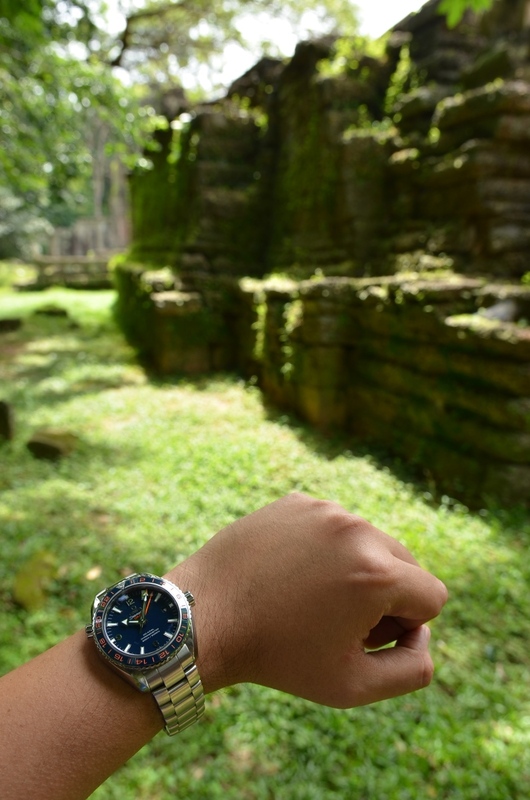 Unlike Angkor Wat which is a single (albeit massive) structure, Angkor Thom appears to be a city with a collection of temples and other structures inside. Bayon Temple is one of them. 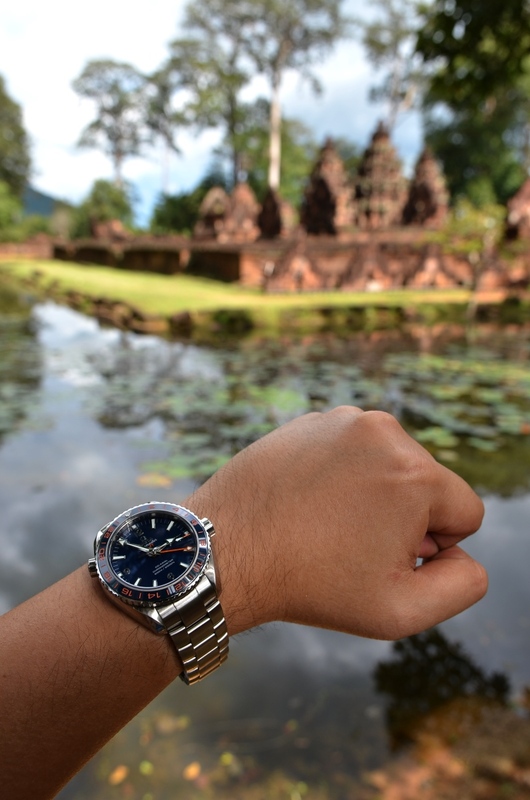 So now you can appreciate that the presence of other Speedmaster Moonphase watches was not a coincidence. Ta Phrom Temple looked quiet and deserted enough for that objective. This place is made iconic by these Sapuang trees that grow on top of the structure with roots that cling to the stone pretty much like octopus tentacles if you ask me. Some say the third engraving from above is that of a stegosaurus. Some say it is more like a rhino with decorative or natural elements in the background. All tourists are free to rationalize or speculate. A closer look at these roots. Lara Croft wasn't present. I'm sorry. After long hours of walking, we decided it would be wise to refresh ourselves before revisiting Angkor Wat. And to think that we came from more or less the same weather as Cambodia but still we were extremely exhausted. 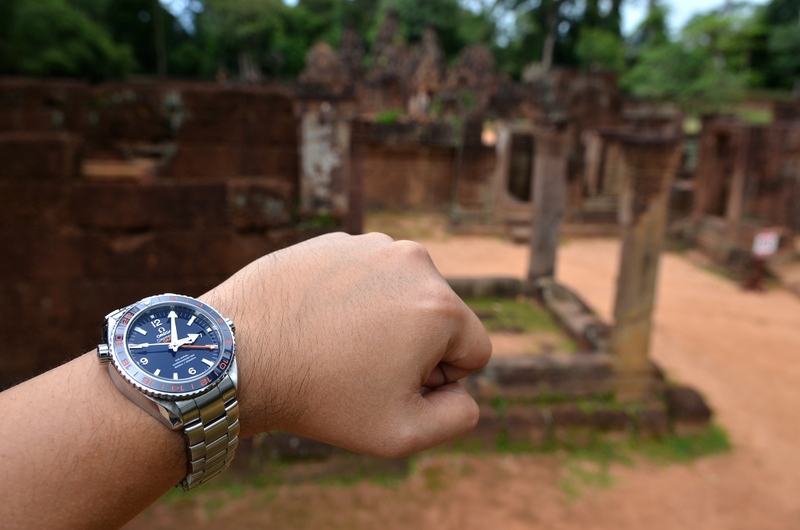 We had a wristshot taken earlier. Now would be the time for a good tableshot! 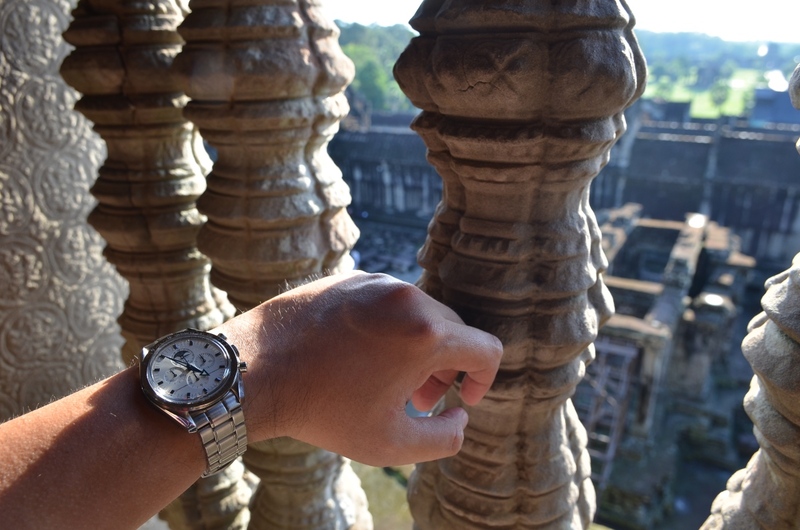 And here we are, at the top of Angkor Wat. The center porch offers a majestic view of the ground below. I couldn't help but wonder what was on the mind of people in those days as they stood at this exact spot. Getting down the stairs turned out to be a bit tricky when you are wearing an oversized backpack. Preah Khan was the last archaeological site we visited on the third and last day of the trip. It is said that a Khmer king built this temple in honor of his father whose ash was stored underneath this stupa. This building looks quite western to me. Our guide told us that soldiers winning and surviving battles were honored here. This structure is also said to have been used to house the king's holy sword. We next visited an arts and craft training center downtown after lunch for a change. Visitors can look closely and take photographs as artisans practice their skills and produce real work for sale. There was still time for a stroll through a tourist's market nearby before heading to the airport. I wanted to take more photographs of the shops but wasn't sure how the owners or the assistants would react to that, considering slightly negative experiences with persistent peddlers we met during at the various attractions. This bookstore did not seem to mind though. Check-in counters were not open until two hours before the flight. A small heaven was found inside after checking in and security check. DQ used to serve this in Thailand but no more. The sunset was quite a sight. It was a shame our flight wasn't one hour earlier otherwise I would have been able to take a better shot on the tarmac. In any case, our plane finally arrived from Bangkok and it was time to go home. Once again, my apologies for not being able to describe each place more expertly. There are more credible resources for that. I hope you enjoyed my pics though. Thanks for looking.